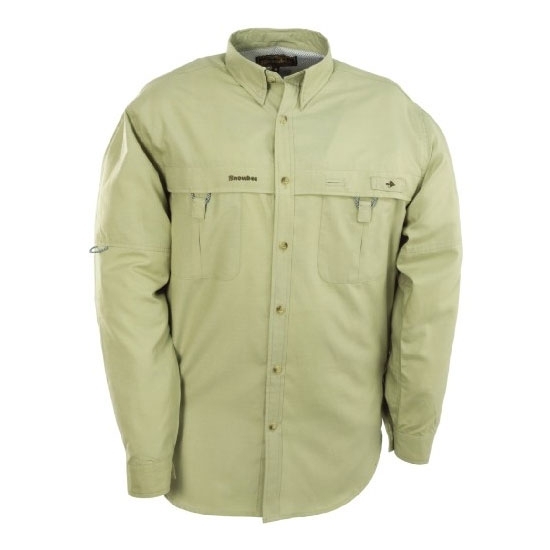 Snowbee Fishing Shirts go back to first principles – cool comfort. Having tried all the latest nylon & polyester ‘technical fabrics’ Snowbee came to the conclusion that these are fine stood on the deck of a flats boat with a cooling breeze, but in more temperate climates are like standing in a bin-bag! Snowbee's technically advanced Poly/Cotton fibre speeds up body moisture absorption, wicking it quickly to the outside, where it can evaporate. Close-knit Oxford weave provides a UPF (Ultraviolet Protection Factor) of 30+, the equivalent of wearing factor 30 sunscreen! Velcro ‘button-down’ collar and rear reinforced Net Loop. 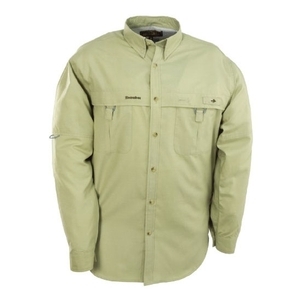 Soft, high-count cotton fabric shirts for crisp, cool comfort in all conditions. The top half of the shirt is lined with a fine mesh, which allows free air passage to prevent the outer material sticking to the skin. The back of the shirt has two side shoulder flaps, plus a full width back flap. Material: 35% cotton, 65% polyester. I am satisfied with the product but was shocked to discover the cost of delivery to Northern Ireland. I was quoted £4.95 for postage and packing but when I entered my postcode I was informed postage would be £9.99. We are part of the UK and to send a similar sized package by Royal Mail would have cost £2.90. My grandchildren live in England and I sent a similar parcel for this price. The Irish Sea is a very expensive stretch of water!My parcel was three days late arriving as it appears to have been at three different DPD destinations two in NI and it even made a brief journey to Athlone in the south of Ireland. At least the cost of delivery covered the fuel prices for its tour of Ireland!The product is exactly as expected but the delivery service was not as expected!